Are you thinking about replacing your current dentures? Then lets work together to make the dentures you want! Denture Relines to improve the fit of a loose fitting denture. We are small friendly Denture Clinic close to Mansfield's town centre and close to all main routes into Mansfield. We provide a friendly, reliable and high quality service direct to the public. Lee Clues is now a fully qualified Clinical Dental Technician with over 25 years experience in the Dental profession. He is able to see complete denture patients directly and partial dentures under prescription. Dentures are a removable appliance that replaces missing teeth. Dentures can take some getting used to and will never feel the same as your natural teeth. With the number of materials available today dentures are much more natural looking and comfortable. The two main types of dentures are Full and Partial. Your Clinician Lee can provide full dentures at our clinic. You simply need to make an appointment for a consultation where Lee will discuss the options available to you. For partial denture wearers a referral letter will be required from your Dentist to enable Lee to carry out any necessary denture work for you. Referral letter templates are available from our clinic upon request, making the referral process more straightforward. If you have any queries please feel free to contact us. This is the first type of denture available. If you have lost all of your natural teeth, then a conventional full denture is used to replace them. If you have recently had any remaining teeth removed it can take your soft tissues several months to heal. A full denture can be placed during this period but due to gum shrinkage your denture will become loose which will mean you either need a reline of your denture or a new denture. This is the second type of denture available. If you still have some of your own natural teeth left but need something to replace your missing teeth then a partial denture can be used. Partial dentures offer a removable alternative to bridges. These can only be provided by us with a referral letter from your dentist. 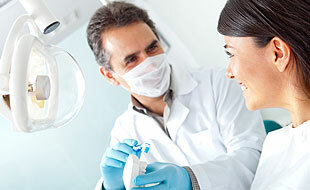 Referral letters for your dentist to complete are available upon request. How long to get used to my dentures? New dentures will feel strange and may feel uncomfortable for the first few weeks, this is quite normal. Eating and speaking with dentures might take a little practice. A bulky or loose feeling is not uncommon, while the muscles of your cheeks and tongue learn to hold your dentures in place. If you experience any discomfort after your dentures have been fitted then you must contact us so we can make you an appointment with the clinician. He will have a look and make any necessary adjustments. Over a period of time, your denture may need to be relined or remade. As you age, your mouth naturally changes. These changes cause your dentures to loosen, making chewing difficult and irritating your gums. At a minimum, you should have an oral health check annually. Lee is able to do this at our clinic if you have a full denture and no natural teeth. Well constructed and good fitting dentures can improve a patients function and aesthetics, providing more confidence while talking and eating. Dentures also give the face support that is otherwise missing with the loss of natural teeth and the supporting bone. Dentures are custom-made in our laboratory. During a consultation with Lee our Clinician, he will discuss your options with you as we have three ranges of dentures. He will only commence once you are happy with his proposed treatment plan.